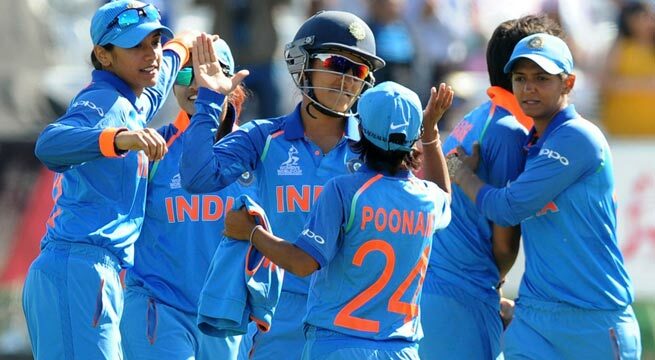 India have the chance to alter the course of cricket history when they face hosts England in the Womens World Cup final at Lords on Sunday. Since the tournaments inception in 1973 two years before the mens World Cup started it has been dominated by England and Australia, with New Zealand, in 2000, the only other country to have won the event. The final sees this years edition come full circle, with India having upset the form book to beat England by 35 runs in the tournament opener in Derby on June 24. It isnt going to be easy for England, promised India captain Mithali Raj after her sides stunning semi-final win over six-times champions Australia in Derby on Thursday. A 36-run victory over the title-holders was built on Harmanpreet Kaurs stunning 171 not out. An innings full of correct yet powerful shots ought to have banished any remaining stereotypes about demure womens cricket in general and the India team in particular. Certainly there was nothing ladylike about the fiercely competitive Kaurs angry reaction towards batting partner Deepti Sharma after almost being run out on 98. For Raj and India pace bowler Jhulan Goswami, the leading run-scorer and wicket-taker in womens one-day international history respectively, this could be the last chance the two 34-year-olds have to win the World Cup. But the significance of the day goes far beyond what it means to their cricket careers. Indias win in the 1983 mens World Cup final at Lords turned the country on to limited overs cricket and led the worlds second-most populous nation to become the sports financial powerhouse. An India win on Sunday could have equally far-reaching consequences, as Raj acknowledged. Its an opportunity for the Indian team to make it big in India, Raj, appearing in her second World Cup final 12 years after her first, said. â€œEverybody will be glued to the television on Sunday, she added while recalling how Indias 98-run defeat by Australia in the 2005 final at Centurion, South Africa, was not even broadcast. If we can pull it off, there will be nothing like it. It will help the future of womens cricket. One pleasing aspect for India of this World Cup is that they have not been over-reliant on Raj and Goswami, who nevertheless produced the delivery of the tournament to bowl Australia captain Meg Lanning for nought in the semi-final. The likes of Smriti Mandhana, Punam Raut and Sharma have also stepped up when needed. England, since their opening defeat by India, have had the potentially useful experience of winning two close games, defeating Australia by three runs in pool play before seeing off South Africa by just two wickets in a semi-final where they stumbled chasing a modest target of 219 in Bristol on Tuesday. England captain Heather Knight is one of several seasoned campaigners along with bowlers Jenny Gunn and Katherine Brunt. But Sarah Taylor, who took heart from the way England had scrapped hard for wins, has arguably been the teams star performer. â€œWe can take a lot of pride into this game regardless of whats going to happen, Taylor said. Weve worked really hard to get here and weâ€™ve fought like anything. Taylor underlined her standing as the best wicket-keeper in the womens game with a superb stumping in a semi-final where she also made 54. Her performances have been all the more impressive given Taylor spent 12 months out of the game with anxiety issues. A year ago I wasnt even thinking that I could potentially play cricket again, so this is massive, Taylor said, adding she now relished the prospect of appearing in a final in front of a sold-out crowd of more than 26,000 at the home of cricket. You want to play at Lords, you want to play in a World Cup final and you want to play in front of a packed house thats the situation you want and weve got it.